In celebration of our 50th anniversary, we’ll be highlighting a few longstanding members of the FGH family. 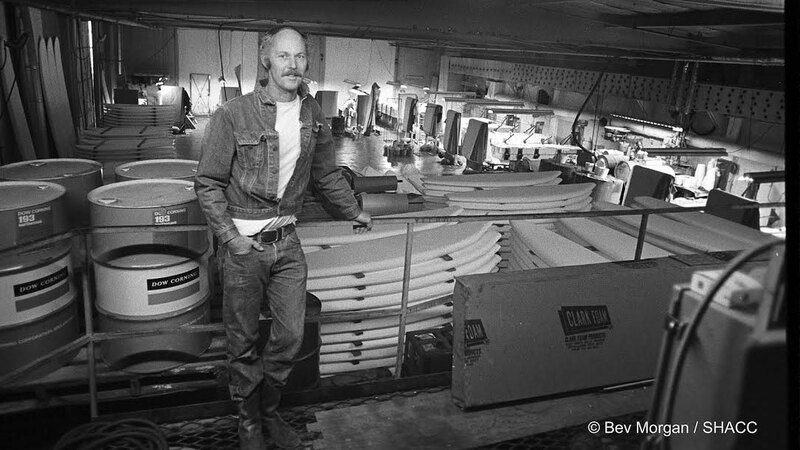 Since 1966 we’ve been supplying the construction, marine, fishing, and surf industry with composites and building materials. While our product line has evolved and expanded, our focus has always been centered around personal relationships. Our legacy is not our own, it is shared among our numerous customers. And we are very proud to share it with Santa Barbara’s own, Bob Haakenson. I started surfing in Encinitas when I was 13 years old. My first board was a balsa board I found in the bushes, all beat up and my first experience working with resin was while fixing that balsa board. 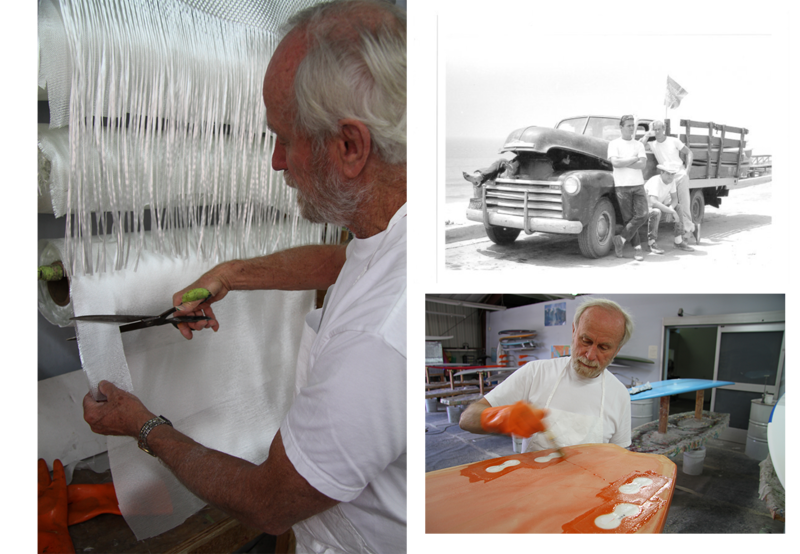 Shortly thereafter, my dad took me up to Hobie Alter’s place to introduce me to this new product called “Clark Foam”. I was instantly mesmerized. I loved the smell of the place; the foam, the wood. All these high-tech, lightweight boards. I bought my first polyurethane board that day, a Hobie, for $75. Swami’s was my local spot. Al Merrick (who was also from Encinitas) and I surfed it day after day with no one around. We used to look up at the cliff, hoping that someone would come down and surf with us. 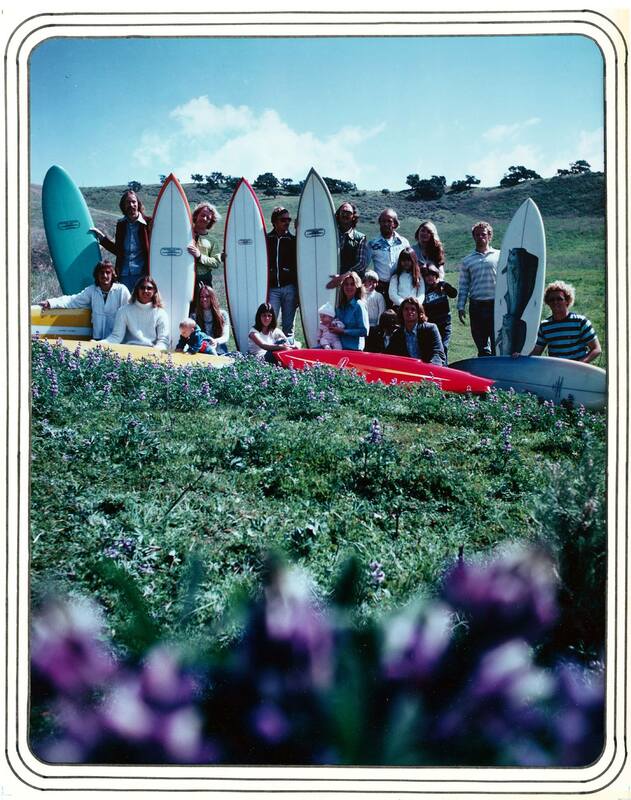 Then, in the mid 60’s the 5 freeway was built through Encinitas and it seems like Swami’s was overcrowded, overnight. Al moved to Santa Barbara in 1966, and I followed in 1967, mainly just to avoid the crowds in San Diego. I absolutely loved Santa Barbara. Bitchin’ place. We surfed Rincon completely uncrowded. 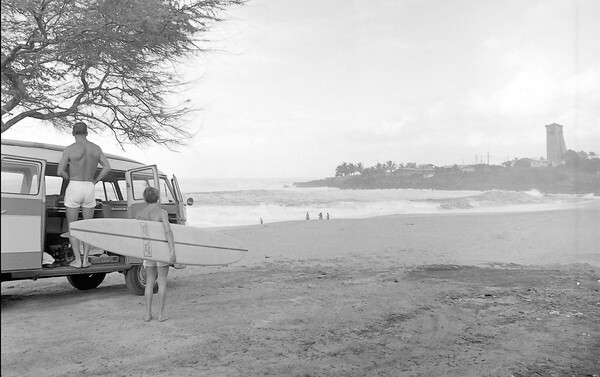 I surfed the huge ’69 swell here (Santa Barbara), then caught it in Hawai’i. I stayed there, had a glass shop at the base of the Waimea tower for 3 years. I’d get hot midday while laminating, so I’d run down to Waimea and bodysurf the shore break or surf Pinballs. I was the only guy surfing Pinballs at that time. I used one particular board that had huge repairs. Obviously, this was the pre-leash era, and if you lose your board at Pinballs it’s guaranteed to hit the rocks. 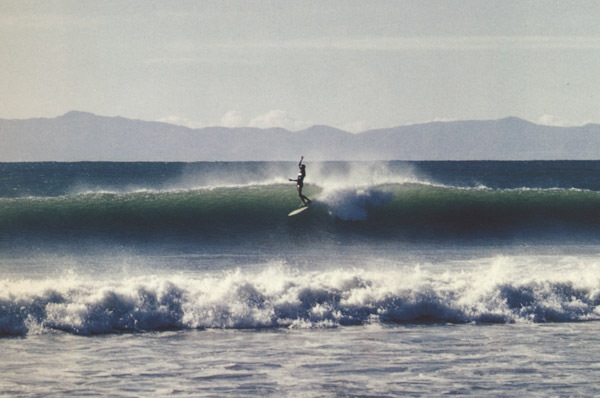 I left Hawai’i in ’73, came back to Santa Barbara and reconnected with Al Merrick. 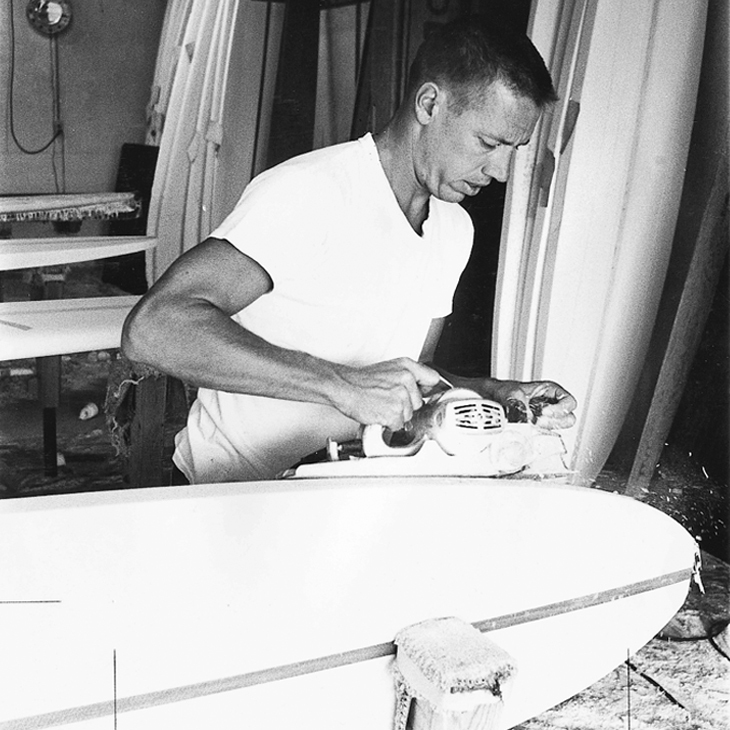 He had a pretty substantial board business going by ’73 so I started glassing surfboards for him. I worked out of his space originally, but eventually transitioned into this little shed up above Refugio where I stayed for 10 years. That was really neat. It overlooked everything from El Cap to Refugio; God’s country. 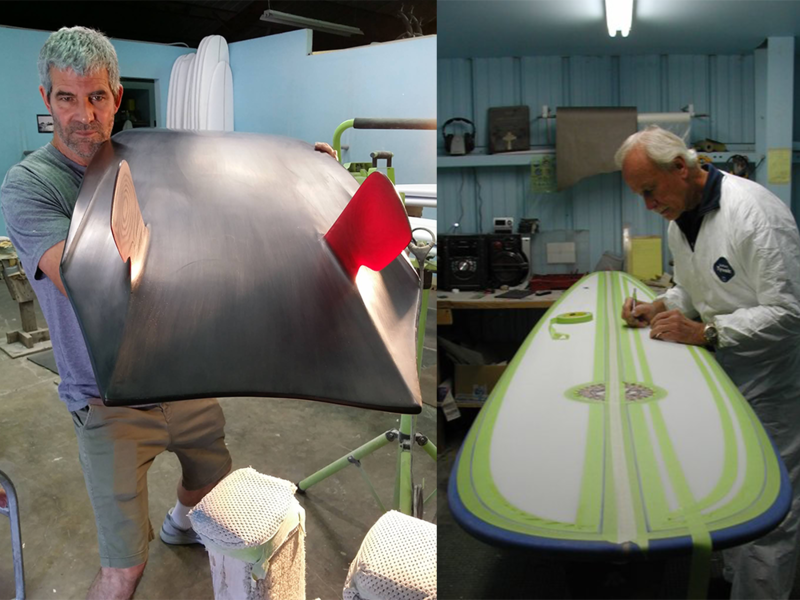 Over the course of the past 40 years here in Santa Barbara, I’ve used Fiberglass Hawaii’s materials to help build Tom Curren’s boards while he was winning world titles, Shaun Tomson’s, Kelly’s for a number of years, Dane’s (Reynolds); all the team riders. I started making boards when I was 18, working with Bear Mirandon. I’ve glassed for Gordon & Smith, Hansen, Surfboards Hawaii. I came up with their “Model A” surfboard as a team rider, which Ed Wright shaped. That became their biggest seller, and incidentally, I’m riding a very similar board right now. It’s similar but wth asymmetrical adjustments, made by Al Merrick. I’ve actually transitioned to riding exclusively asymmetrical boards nowadays. Especially riding these right-hand point breaks around Santa Barbara. My toe-side rail is longer which enables more drive from the board, but the heal-side rail line is much shorter and cut out at the tail, so it creates a much tighter turning radius both off the lip and on the open face. It has the speed and paddle benefits of a longer board, but the performance characteristics of a shorter board. on his latest creation. And Bob in 2010. I finish a lot of Wayne Rich’s boards and he’s explored asymmetry in depth. We made Tommy Curren an asymmetrical 5 fin recently, but I haven’t heard any feedback yet. He’s really preoccupied with that skimboard right now. Asymmetry has really revitalized my passion and interest in both surfing and board design. We’ve been in this current location, on Kellogg, for about 15 years now. Board building has changed a lot over the decades, but at the same time, the fundamentals haven’t changed at all. There’s a few new names, but we’re also still building boards for the same shapers we started with. It’s been a great half century and we’re thrilled to keep going! Bob Haakenson’s current client list includes Marc Andrieni, Renny Yater, PJ Wahl, Dave Parmenter, Bruce Fowler, John Lalanne, Joey Boards, and many more. 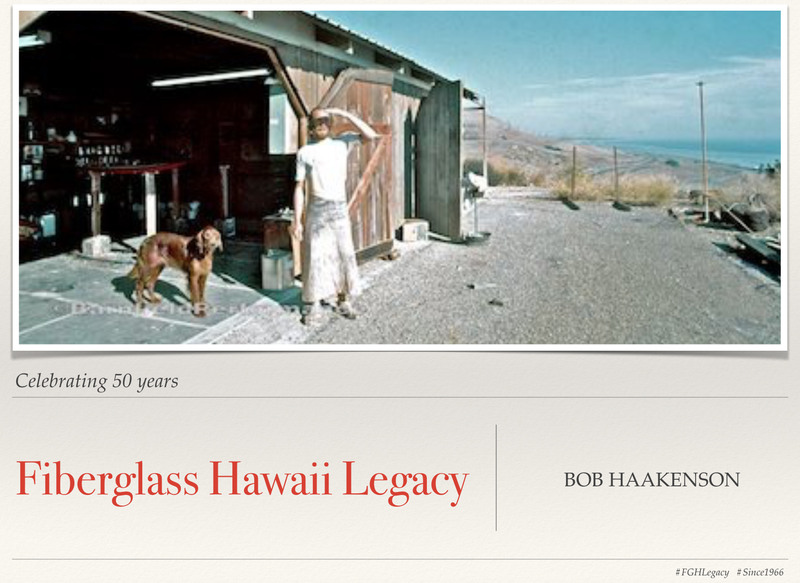 and follow @FiberglassHawaii to learn more about our 50 year legacy of providing fine fiberglass and composite materials. Great to see a new story on the site. Looking forward to more videos too.